The Galapagos giant tortoise is one of the most famous species in the Archipelago. Originally, 14 subspecies inhabited the Islands and their morphological diversity was one of the inspirations for Darwin’s theory of evolution. There are now only 10 subspecies left after the last Pinta tortoise, Lonesome George, died in 2012. Over the past three centuries the giant tortoise population has experienced a ~90% reduction in size. Early losses were due to whalers and other travellers killing tortoises for food and oil. More recently, introduction of invasive species has also caused losses; for example, goats destroy the vegetation tortoises feed on and rats predate directly on young tortoises and eggs. The good news is that there are many dedicated conservationists working to ensure these enigmatic animals are protected into the future – something that is very important as they are essential for a healthy Galapagos ecosystem. Giant tortoises are affectionately known as ‘Galapagos gardeners’ and perform two crucial roles in the ecosystem. Firstly, they are vital to the landscape, forcing their way through dense vegetation on the islands they inhabit, and secondly they spread seeds across these islands. They are one of the most iconic species of Galapagos, and although they have been the subject of scientific studies for nearly 300 years, much of their life history remains a mystery. Since 2009, the Galapagos Conservation Trust have supported the Galapagos Tortoise Movement Ecology Programme which aims to understand more about the migrations of giant tortoises on different Islands and how we can better protect them. To find out more about our work tracking giants click here! 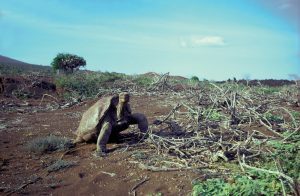 Categories: Discovering Galapagos Updates, Projects | Tags: Blog, Floreana, Galapagos giant tortoise, Isabela.